The Enhanced-Discretization Space-Time Technique (EDSTT) provides a multiscale space-time framework where fluid-structure interaction (FSI) computations can be carried efficiently and accurately even when the structural dynamics part requires a much smaller time-step size. Only the time-step size for one or a few layers of fluid mechanics elements needs to match the structural dynamics time-step size, and for the rest of the fluid mechanics elements the time-step size is determined based on the requirements of the fluid dynamics part. The EDSTT was introduced in [1-2], and the test computations were reported in . The EDSTT is based on using, in the context of the Deforming-Spatial-Domain/Stabilized Space-Time (DSD/SST) formulation [4-7], multiscale function spaces associated with multiple space-time finite element meshes. 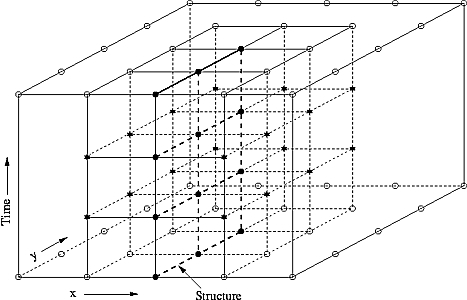 For the fluid mechanics part, the second space-time mesh, which has the smaller time-step size, is built on top of the first one, adjacent to the structure and covering only one or a few layers of the first mesh. The efficiency of the EDSTT becomes even more dramatic when the structural dynamics part has a lower dimension than the fluid dynamics part. In the EDSTT, the two different time-step sizes are used in the fluid dynamics part in an implicit fashion, and therefore the technique possesses the desirable features of the implicit methods. In the 2D FSI test problem reported in , flow past a thin, flexible beam is computed with a structural dynamics time-step size that has to be 20 times smaller than the fluid dynamics time-step size. Fig. 1. A fictitious 3D space-time domain with two different space-time meshes involving different time-step sizes. In this example, the fluid dynamics problem is 2D and the structural dynamics part is 1D. Fig. 2. 2D flow past a thin, flexible beam. In this FSI computation the structural dynamics time-step size that is 20 times smaller than the fluid dynamics time-step size. The pictures show the pressure (left) and vorticity (right). 1. T. Tezduyar, "Finite Element Interface-Tracking and Interface-Capturing Techniques for Flows with Moving Boundaries and Interfaces", ASME Paper IMECE2001/HTD-24206, Proceedings of the ASME Symposium on Fluid-Physics and Heat Transfer for Macro- and Micro-Scale Gas-Liquid and Phase-Change Flows>, ASME, New York, New York, CD-ROM (2001). 2. T.E. Tezduyar, "Finite Element Methods for Fluid Dynamics with Moving Boundaries and Interfaces", Chapter 17 in Encyclopedia of Computational Mechanics, Volume 3: Fluids (eds. E. Stein, R. De Borst and T.J.R. Hughes), John Wiley & Sons (2004). 3. T.E. Tezduyar and S. Sathe, "Enhanced-Discretization Space-Time Technique (EDSTT)", Computer Methods in Applied Mechanics and Engineering, 193 (2004) 1385-1401. 4. T.E. Tezduyar, "Stabilized Finite Element Formulations for Incompressible Flow Computations", Advances in Applied Mechanics, 28 (1992) 1-44. 5. T.E. Tezduyar, M. Behr and J. Liou, "A New Strategy for Finite Element Computations Involving Moving Boundaries and Interfaces -- The Deforming-Spatial-Domain/Space-Time Procedure: I. The Concept and the Preliminary Numerical Tests", Computer Methods in Applied Mechanics and Engineering, 94 (1992) 339-351. 6. T.E. Tezduyar, M. Behr, S. Mittal and J. Liou, "A New Strategy for Finite Element Computations Involving Moving Boundaries and Interfaces -- The Deforming-Spatial-Domain/Space-Time Procedure: II. Computation of Free-surface Flows, Two-liquid Flows, and Flows with Drifting Cylinders", Computer Methods in Applied Mechanics and Engineering, 94 (1992) 353-371. 7. T.E. Tezduyar, "Computation of Moving Boundaries and Interfaces and Stabilization Parameters", International Journal for Numerical Methods in Fluids, 43 (2003) 555-575.